Ski Adventures: Avalanche tragedy: could your lift pass save your life? My company Ski Adventures is an independent chalet holiday company in Les Arcs Paradiski, in the French Alps. For over 15 years we have welcomed thousands of guests to the the magic mountains of Les Arcs. This blog contains my views and ideas about life here, in the resort and in the valley town of Bourg St Maurice, and wider views about the ski industry generally. Avalanche tragedy: could your lift pass save your life? Everyone in and around Les Arcs was deeply shocked by the death of a 41 year old Russian skier who was avalanched on the Grand Renard piste above Arc 2000 on March 30th. She was skiing with her husband, child and an instructor when an avalanche, some 50m long and 15m wide spontaneously released from the steep slope above the piste. The avalanche was only 1.5m deep, but the heavy, wet snow pulled her over and dragged her under. 20 rescuers were soon on the scene, and she was discovered alive half an hour later, in a state of cardiac arrest. She was helicoptered to Grenoble CHR, where tragically she died the following morning. Avalanches on the piste are perhaps the event most feared by ski resorts, who employ dozens of people and spend lots of money on a variety of techniques and methods whose aim is to release safely any accumulation of snow that could threaten the resort, the pistes or the skiers below. Strangely, hearing the distant booms and bangs of avalanche release at breakfast time in the chalet is invigorating: it means plenty of fresh show has fallen during the night, and it's also reassuring to know the resort is already being made safe by the pisteurs. Thankfully, such accidents are incredibly rare. Last season, according to the annual Pistehors avalanche survey there were 23 avalanche death in France, in 15 separate incidents. None of these happened on piste. The type of avalanche which occurred on Grand Renard was described as a 'wet snow slide' release, which are notoriously difficult to predict and impossible to pre-release by the methods described above. 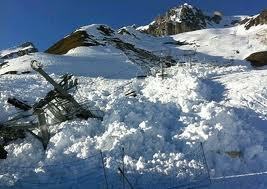 This is the same type of avalanche, typically occurring later in the season when temperatures rise, that destroyed an entire chair lift in St Francois de Longchamp last season (fortunately no casualties due to the brave and timely actions of the lift operator) and took the life of Les Arcs founder Robert Blanc in 1980. Piste skiers can't be expected to carry an ARVA (avalanche transceiver which transmits the location of a buried skier and enable sesrchers to detect and localise that transmission signal), or the attendant probes and shovels without which the ARVA is fairly pointless. Anybody, however, who goes off the piste at all (even staying within sight of the piste) should have an ARVA and know how to use it. Les Arcs has an 'Avalanche Park' at the Col de la Chal (top of Transarc Lift) where a pisteur will train you for free to use one correctly. I often point out to my guests that apart from increasing the chances of surviving an avalanche yourself, you are also reducing the risk to those who come to rescue you (often amounting to dozens of people) who will be placing themselves in a potentially fatal location for as long as it takes to dig you out. 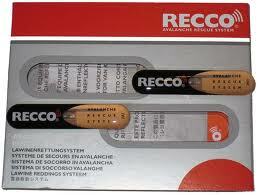 There is also a perhaps under-rated system of 'passive' avalanche safety called RECCO. 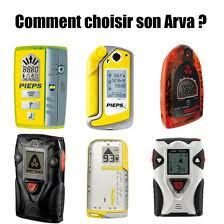 Based on a system of small reflector devices, that can be sewn into clothes or stuck onto boots, etc., it enables ski resort equipped with the RECCO detectors (and almost all resorts are) to find avalanche victims in about the same time as if they were equipped with an ARVA device. This would seem to be the perfect solution for piste-skiers who, in the unlikely event that they were avalanched on piste, would be in fairly close proximity to potential professional rescuers, rather than having to rely on the efforts of the comrades in a more remote location (remember that 93% of avalanche victims will survive if dug out within 15 minutes). Some clothing manufacturers incorporate the reflectors into their products, but you can also buy a pair (two are recommended) and stick them on your boots, like I did with mine and my wife's many years ago. RECCO technology is now included in all Ortovox transceivers as a back-up and it has been adopted by NATO as part of their search and rescue protocol. Thinking about this made me wonder why the passive reflector technology of hands free lift passes couldn't also be used in avalanche detection. Presumably it works in much the same way, even if perhaps some adjustements were needed. 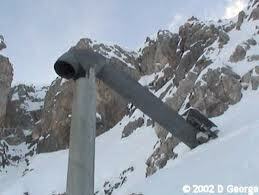 Perhaps the RECCO technology could be built into the lift pass? Detecting the victim's lift pass could also yield other information, like whether it was an adult or child or their age. Perhaps the time saved if such a device had been present would have been enough, in the tragic case of the Russian skier, to have made the difference between life and death. RECCO built into a lift pass; what a great idea, it is the implication of responsibility that would make if difficult to do I guess. Arc 1800: The Dawn of a New Area? Cyprus - a threat to Les Arcs? Moving mountains: a new piste to Bourg?